Restorative justice is a beautifully challenging undertaking. Its focus on relationships and alignment with gospel values of mercy, redemption and reconciliation inspire hope for a renewed spirit of justice. However, this approach is so drastically different from America's adversarial and retributive response to harm that it can be difficult to envision another way. It was this fundamental question of how to build a more faithful response to harm that was a catalyst for Catholic Mobilizing Network creating tools that meet people in their brokenness and move them toward wholeness. Since the inception of CMN, we have heard stories from victims of grave harm: of how the criminal justice system re-victimized them. CMN’s nearly decade of experience seeking to end death penalty in the United States inspired the development of our small group educational modules, Restorative Justice, Restorative Living: A Lens for Learning and Action. The program invites participants to learn together about the big ideas and practical applications of restorative justice, all the while interweaving prayer and Catholic Social Teaching. This was an exciting year as CMN piloted the modules throughout the country. Blessed Sacrament parish in Charleston, WV hosted a Lenten series that included members of parish council, a Catholic school teacher and parish staff. Co-facilitator, Sr. Rose Ann Hefner, said, “Many of our participants were clueless as to the meaning of restorative justice, so this was a great introduction. The program inspired several of us to want to move on to explore the next step.” The modules opened up spaces to dialogue about the statewide teachers’ strike, opioid epidemic and parish safety in times of increasing gun violence. In northern California, Cat Willet at Catholic Charities of East Bay and Carrie Rehak of Graduate Theological Union partnered to host two diocesan-wide retreats. The events were made especially powerful by including a local prison minister and formerly incarcerated individual to speak about their experiences with the prison system. Following the retreats, Cat Willet shared, "The content is great and compelling and has led, both times, to deep conversations and personal commitments to learn more and reflect on how to bring the practices to parishes and organizations." Meanwhile, in Houston, TX, Katarina Goitz, an Echo Apprentice at Church of the Resurrection wanted to host the modules at her parish, but a group was not ready to commit to the full program. So she adapted pieces to use as an invitation session. 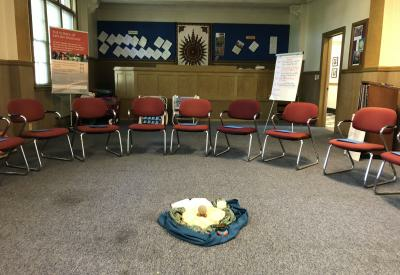 Over the course of a two hour session, the group reviewed restorative justice philosophy and related Catholic values, watched a video of restorative practices used in schools and held a talking circle in which participants shared what motivated them to attend. Participants left feeling exhilarated and the parish plans to host the full program in the fall. Several of those who attended expressed an interest in creating a ministry for those transitioning out of prison. Each group and individual comes to restorative justice with a unique background and set of hopes. Restorative Justice, Restorative Living: A Lens for Learning and Action honors this diversity in its ability to welcome a multitude of perspectives and be adapted according to the needs of the group. This pilot year provided life-giving insight to participants and CMN alike. We are eager to partner with even more parishes and ministries in the coming year. If you are interested in bringing this program to your parish or ministry, contact Caitlin Morneau, Director of Restorative Justice at caitlin@catholicsmobilizing.org.